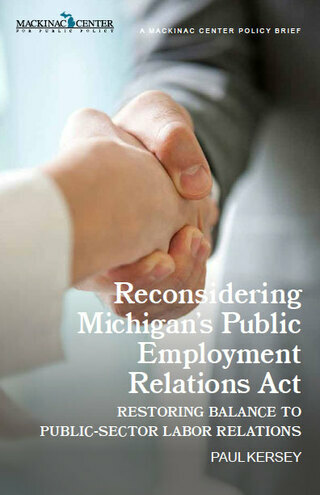 As much as one might question the actions and priorities of government employee union officials in the state of Michigan, the practice and effects of collective bargaining are ultimately the responsibility of the Legislature. It was the Legislature that passed the current PERA. The Legislature has revised the statute to positive effect in the past. As collectively bargained benefits become more and more burdensome for local governments, those governments and taxpayers understandably will look to the Legislature for relief. When the state imposes collective bargaining on local governments and school districts, it inevitably infringes on local control of government. The infringements created by PERA have contributed to a growing financial crisis and have elevated government employee unions to a disproportionately powerful position in state and local politics, a position that they have used recklessly. It is incumbent on the state Legislature to rein in government employee unions and restore local control to the people of Michigan. At a minimum, this will mean revising PERA. The point of bargaining — in any context — is that both sides attempt to work out an agreement that leaves them better off than they would have been otherwise. If the parties — be they unions and employers or a pair of kids swapping trading cards — cannot find a deal that suits them both, then negotiations end without a contract. This “win-win or no deal” rule lies at the core of genuine good-faith bargaining. The win-win or no deal principle leads directly to the conclusion that the bargaining mandate in PERA should be eliminated. Ideally, local government collective bargaining should be prohibited outright. If the Legislature is not prepared to take that step, PERA’s bargaining mandate should be removed and bargaining should be left to the discretion of local officials with certain basic protections for workers and taxpayers. At the very least, the Legislature should consider targeted reforms — such as an open government employment rule and suspension of bargaining and contracts in strikes or financial emergencies — that can ameliorate the problems associated with mandatory collective bargaining. But the Legislature should act decisively. Under no circumstances should local governments or school districts be left in a position where obeying the law is likely to lead them into signing a contract that is not in the best interests of the public that they are supposed to serve.